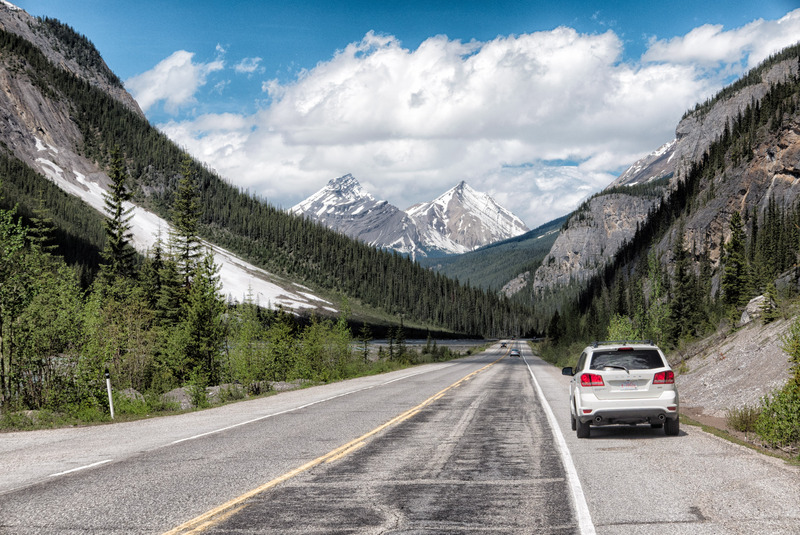 The first hour of the drive towards the Icefields Parkway was the same route along Highway 1 as we took to Lake Louise yesterday, and was despatched pretty quickly without fuss. The only thing we found noteworthy was the fairly frequent, and wide bridges over the highway. These appeared odd at first because rather than being flat on top, they had a couple of humps mirroring where the arches over the road were below. They also appeared to be full of bushes and trees. The continuous chain-link fences either side of the highway provided a further clue; these were animal bridges, not human ones. Rather clever, and probably essential to allow animals access to the wilderness either side of the road. The trip began to feel more exciting shortly after we passed the Lake Louise junction and took a left onto Highway 93, heading out onto the Parkway proper. This was a smaller two-lane road, even though the wide shoulders made it much bigger than most UK A-roads. We’d hardly got used to the change in pace when we came across a small huddle of cars on the wrong side of the road ahead. It wasn’t hard to guess what was happening – there must be a wild animal of some sort visible from the road. Imagine how happy we were to find it was a bear, a nice black one too! It seemed to be about the size of a small human, though an impossibly bulked-up human on all fours. If it put me in mind of anything, it was a large black version of an Old English Sheepdog. 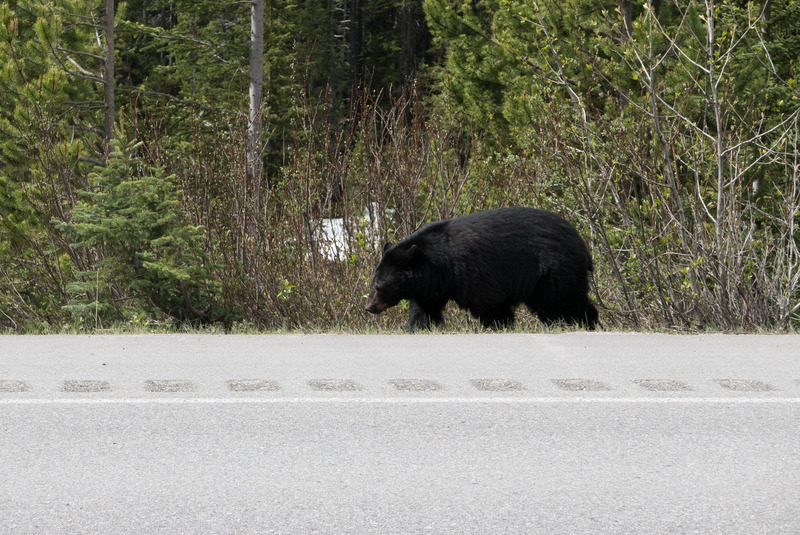 The bear was walking really close to the shoulder of the road, shuffling nonchalantly right by our stopped car at one point. It was totally oblivious to the consternation it was causing, busy with it’s own beary business. Very cool to see our first bear though. Not far up the road from the bear we started to pass gatherings of cars and people in roadside car parks and lay-bys. Each time we came to one of these, we’d usually have to navigate a coned-off contraflow system designed to slow down the traffic. It soon became obvious from the number of sporty vests, shorts, pinned on numbers and other paraphernalia that this was some kind of running event, and it seemed to be taking place along the length of the Parkway itself. For many, many miles after this we’d have to slow for the fleets of support vehicles, either parked on the shoulder or suddenly pulling over as they spotted their own runner on the other side of the highway. Each of these support vehicles would have the name of their team on a large banner in their vehicle windows, and we derived much amusement from punning nature of the names. Among my many, many favourites were The Running Dead, Drinkers With a Running Problem and the Bikini Boot Camp Babes. Alas the latter didn’t seem to be in bikinis though. More soberly, given our bear sighting just a little further back down the road, one team were simply called Bear Bait. The logistics required organising such a huge spread-out event involving hundreds of people must have been staggering. It was a long time and many miles before we passed the last support vehicle and runner. 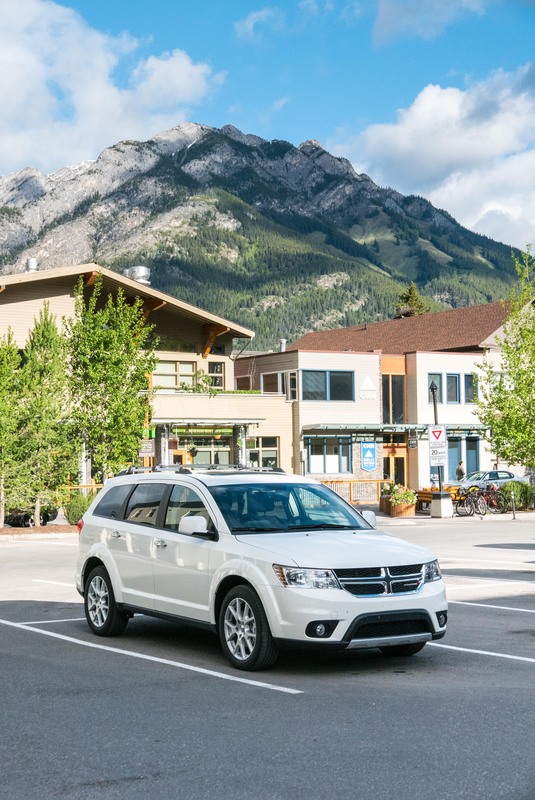 Later that day, once we reached our hotel in Jasper, I consulted google and found that these people were apparently taking part in the annual Banff-Jasper Relay, a 260km long relay race encompassing the whole Icefields Parkway. Pretty impressive. Bow Lake from Num-ti-Jah Lodge, Mt Jimmy Simpson behind. Now we have the road back to ourselves it’s probably time to mention the scenery we’re passing through during all this. 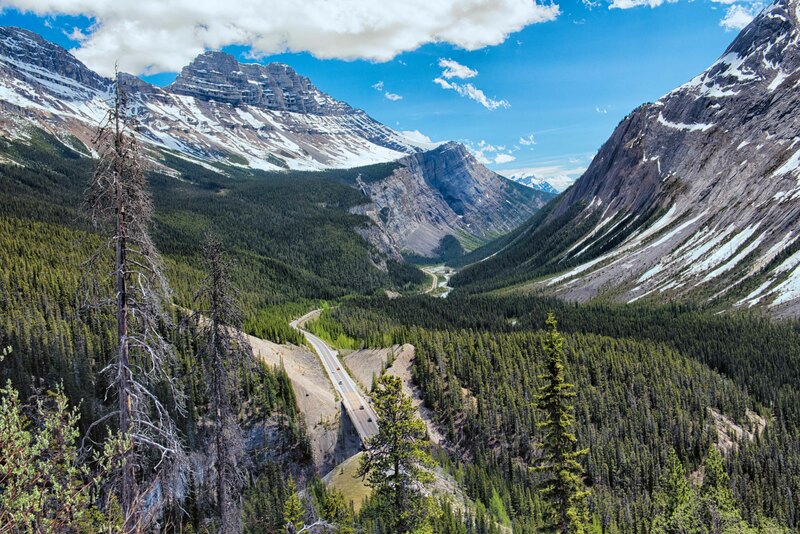 This part of the Parkway traveled along the Bow River valley floor with the river itself on the left and snow covered mountains rising each-side. The road steadily climbs getting colder outside as the mountains get higher and the snowline closer and closer. It’s almost impossibly picturesque. After 30 minutes out of Lake Louise way we decide it’s time for a coffee break. 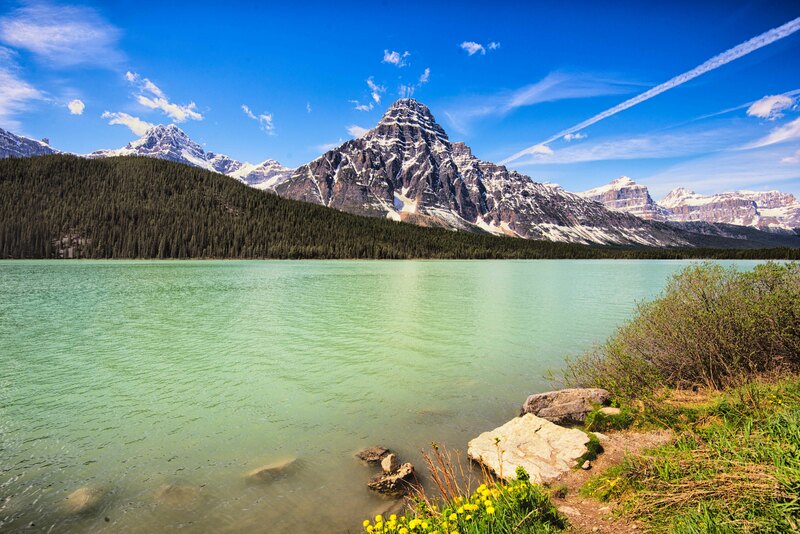 Conveniently at this point we reach the Num-ti-Jah Lodge, which sits on the shores of the Bow Lake. A long driveway leads towards a large gravelled parking area. There’s a short walk along an unmade road to the lodge itself and a surprising amount of ploughed snow by the side of the paths. In fact, I have to wade through quite a lot of snow in my entirely inappropriate deck shoes to get the photographs of Bow Lake that you see here. Suitably refreshed with coffee & hot chocolate we’re back down the road, but only for a short distance before we come to the turn off for Peyto Lake overlook. The car park is again half hidden under ploughed snow and the trails look bad. I set off up the short walk to the overlook, but even with my hiking shoes I haven’t gone very far before I feel I have to turn back – the trail is so busy and so slippy, with the slush turned to ice, that I am sure I’m going to tumble at any moment. My shoes seem to be like skates for all the gripping they do. Some of the more sensible people have snow spikes and poles, meaning they can get up the trail fairly easily, but there’s many other people in totally unsuitable footwear. Most of them persevere, slipping and sliding their way up the hill, but I am convinced I am going to go arse over tip at any moment, so turn back. Missing the lake is a bitter pill to swallow, but seriously, you could easily break a leg on the trail, which would not be a Good Thing. Somewhat (very much, actually!) chastened we head back on the road again. The scenery helps dull the disappointment because the spectacular views just keep coming, and the weather remains perfect. I had budgeted time to re-drive the Parkway if we got clouded in or something like that, it doesn’t look like it will be necessary because it doesn’t get much more glorious than this. There are long, straight valley sections with the road here running alongside the North Saskatchewan River with peaks rising either side. At the mid-way point, simply called ‘The Crossing’ and named for the T-junction it forms with the David Thompson Highway, we pass the only gas station on the Parkway (we have plenty, thanks) and marvel how busy the cafe and car park seems to be. Soon after we climb the huge loop of tarmac that rises over Parker Ridge and gives us a panoramic view back over the way we have come. Amazingly it’s only just over an hour before we reach our final stop of the drive – the Columbia Icefields Centre overlooking the Athabasca Glacier. 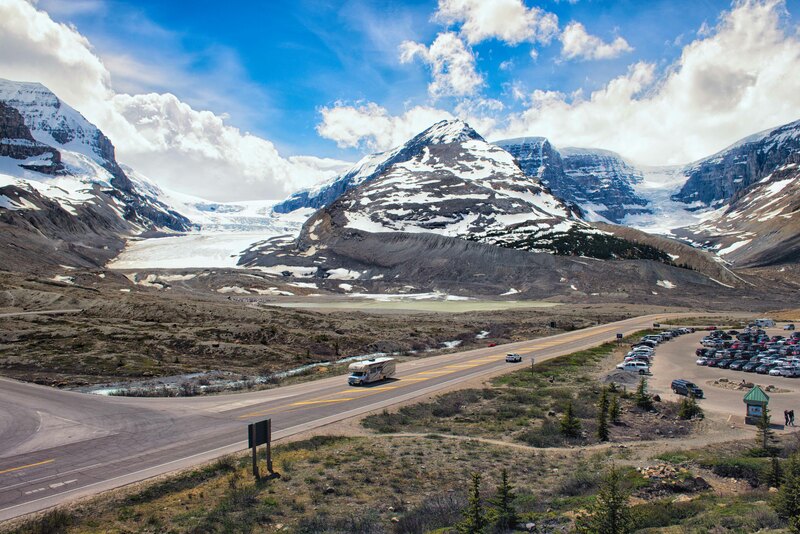 A vast car park at the side of the highway is overlooked by huge, multi-story wooden building, which in turn looks back over the road towards Mount Athabasca and the two glaciers sliding down its side. We make our way into the main building and find the cafe and a space on the vast outside deck to take in the view whilst we have a late lunch. At first it’s impossible to make sense of the scale of the mountain and glacier. It’s only when you see tiny orange dots far, far up the mountainside and realize that they are huge off-road coaches taking tourists for a close-up view that you grasp how damn big the whole thing is. Athabasca (L) and Columbia (R) Glaciers as seen from the viewing deck of the Columbia Icefields Centre. Now, with lunch despatched we have the option of heading out onto the glacier for a trip on one of those distant snow coaches. the way they work is you get on a regular coach which takes you the 3-odd miles partway up the the mountainside then transfer to the 4WD vehicle for the final leg. For this you will pay $85 each. You do get a go on the glacier skywalk included in this price (of which more anon). However, there are a lot of people queuing, and when I say a lot I mean A LOT. There are coaches and coaches of tourists stood in line. I’m sure there would be room for us, but it’d be a long wait and to be honest, we’re not that bothered. It sounds wussy, but when you that, remember we did go on both cable cars (oh, spoiler alert, another cable car!). So it’s not that much longer before we return to the car and move on. We soon pass the glacier Skywalk further up the road – only accessible by coach from the Icefields Centre. I am not one for heights, so I don’t actually care about by passing this tourist attraction. The next ‘must see’ thing on the road are the Athabasca Falls, which are less than an hour up the road from the Icefields Centre. I am going to shock you now because we just drove straight by. 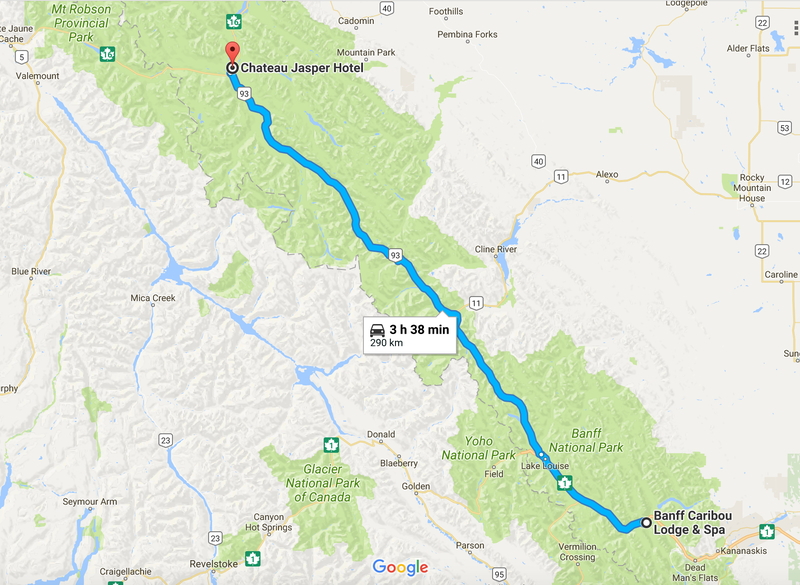 However, they’re only 20 minutes or so out of Jasper, where our hotel is, and as we’re feeling a bit overwhelmed with the long drive, we elect to head to Jasper and come back to the falls tomorrow. Our hotel is the Chateau Jasper, buried somewhere deep within the town. Luckily the SatNav knows where to go and we easily navigate the grid of streets. It’s a been a long day on the road, and we’re glad to reach our night’s accommodation.